Looking for closure? You’ll find it at Rieke Packaging right here in Rohnert Park. Rieke Packaging is an advanced manufacturer, and industry leader, in the plastic closure packing industry. When the focus in packaging is all about conserving resources, Rieke Packaging holds patents that secure goods in ways that help the environment and save money by reducing freight and warehousing costs. Living up to their name, the engineering group at Innovating Molding designs and manufactures everything from their own tooling and support equipment to their custom manufacturing processes. With over 25 years experience, they serve a growing customer base throughout North and Latin America in the liquid and dry foods, beverages, pharmaceuticals and nutraceutical industries. When it became apparent to the team at Rieke Packaging that they would need a larger manufacturing facility, they had a few requirements. Remaining in the North Bay was a big one, as the majority of their employees live here, and they felt strongly about accommodating them. While they considered a few locations, Rohnert Park rose to the top, particularly when the city offered to help in the search, inspection and licensing process. 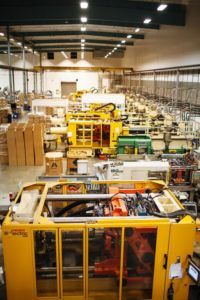 In 2011, Rieke Packaging moved their production facility to a 120,000 square foot facility in Sonoma Mountain Village in Rohnert Park (the former Hewlett-Packard and Agilent space). Moving to Rohnert Park is paying off big time for Rieke Packaging, both in business and people. They only moved 14 miles from their previous location, but they gained 40% more production space in a state-of-the-art facility that includes one of the West coast’s largest solar installations and weatherproof drive-in loading bays. Relying as they do on daily truck shipments, Rohnert Park’s wide streets and central North Bay location work perfectly. Plus, there are local FedEx and UPS offices within easy reach. Here in Rohnert Park, we’re proud to have companies like Rieke Packaging contributing to the talent and opportunity in the manufacturing and engineering sectors here, along with the positive spirit they bring to our neighborhoods and communities. Rieke Packaging employees enjoy Rohnert Park’s easy living, people friendly attitude, mild traffic, quality schools and nearby shopping. Which is probably why 1 in 5 employees make their home here. Onsite parking and easy access to Highway 101 makes getting to and from work a breeze. Ask an employee at Rieke Packaging and they’ll tell you they love the restaurants on East Cotati Avenue or strolling down the street to Sally Tomatoes.